Our goal is to make our home, Sonoma County, and all rural areas, safer for animals and humans in emergencies and disasters. Find information here for on-line learning, real-time trainings, workshops, and other education opportunities. Updated frequently as trainings are added. The Large Animal Rescue Co. provides professional training in Technical Large Animal Rescue (TLAR). UCD-IAWTI seeks to share and disseminate animal welfare knowledge with universities, veterinarians, first responders and the general public. 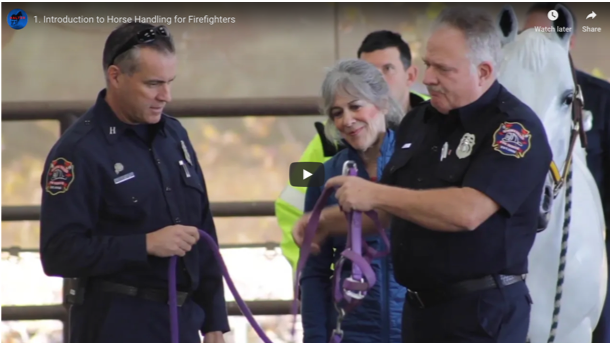 UCD-CEH is joining forces with the Western Institute for Food Safety & Security (WIFSS) and the International Animal Welfare Training Institute (IAWTI) at UC Davis to develop a training program for first responders and community volunteers. WIFFS Animals in Disaster Courses will help prepare first responders and community members for animal related emergencies. READY MARIN Marin County CERT and Get Ready programs teaching residents how to get prepared in case of a disaster or emergency. RedRover Responders Volunteer Training - Specially trained RedRover Responders volunteers shelter and care for animals displaced by natural disasters and rescued in criminal seizures from cruelty conditions, such as puppy mills or hoarding situations. Red Cross of Northern California Volunteer Opportunities - Every dedicated Red Cross volunteer makes a positive difference. We invite you to explore the many volunteer opportunities available. Note: IS-200.b is an updated version of the IS-200 course. If you have successfully completed IS-200 or IS-200.a, you may want to review the new version of the course. For credentialing purposes, the courses are equivalent. Online Course. This course is intended to help animal owners, care providers, and industries to understand incident management. This course combines the knowledge of livestock producers and emergency managers to present a unified approach to mitigate the impact of disasters on animal agriculture. The Rural Domestic Preparedness Consortium, led by The Center for Rural Development, is a DHS funded program providing training and resources to rural first responders. RDPC courses are offer both in-person and online, and are provided at no cost. More information about the RDPC can be found at www.RuralTraining.org. Offered by the Univ. of Florida College of Veterinary Medicine, this course contains information about techniques used for Animal Technical Rescue, including understanding scene size-up, recognizing the need for technical rescue, identifying necessary resources and determining how to obtain them, demonstrating equipment identification, recognizing the hazards associated with animal technical rescue, and describing the methods for mitigating these hazards. The course addresses topics covered by NFPA Standards 1670-17 and 1006-17. This course is for firefighters and others with a desire to respond to, or support responders, at incidents involving animals. This course meets and exceeds NFPA 1670 Chapter 9 and Annex J standards and covers the most likely animal species that first responders are called to rescue and manage: cattle, (beef and dairy), horses, including working horses, (police mounts,SAR), companion animals and working dogs, (SAR, K-9). This 5-hour class covers basic safety and situational awareness in Wildland and Suburban fire, flood/slide, and earthquake. Training includes required modules for many Community Animal Response Teams, (not including Sonoma CART). Enrollment is open to anyone interested in Volunteer Disaster Service Work, stable, farm, sanctuary, animal shelter other facility managers and workers, and anyone interested in being safer during and after a disaster. This new classroom course is required for all California firefighters and other first responders planning to certify as Animal Rescue Technicians. It is recommended for LEOs, ACOs, veterinarians, and dispatch professionals to facilitate understanding and awareness of the roles and responsibilities of certified ATR resources in incidents involving animals. This three-hour class is for Agriculture business owners, their workers who may be permitted to enter Mandatory Evac Zones to care for their property and animals during an ongoing disaster, and, other Ag industry workers who may be called upon by Incident Command to assist them. THIS CLASS IS FULL! If you want to be placed on the wait list, please register using the link below, and we will contact you if space becomes available. This half-day class covers basic safety and situational awareness in Wildland and WUI fire, flood/slide, and earthquake. Training includes required modules for most Community Animal Response Teams. Class is taught by State of California Fire Training Instructors. Feb 3 will be for returning volunteers who have attended this training previously. This training is held annually and is one of the requirements to become eligible as an Animal Disaster Service Worker for Napa CART. So attendance is important! For those that are new to Napa CART or did not attend this training last year. This training is for RETURNING volunteers - only - will be held on Saturday, January 26, 2019, from 0900-1700. The location will be determined when we confirm the number of participants. . This training is mandatory for all Evacuation, OWCN, and supervisory personnel, but recommended for all returning volunteers. All active returning volunteers are asked to contribute to our training costs through a $50 Annual Training Fee. This helps cover the cost of our overhead training expenses. Cost: Registration for new students is $100 for Butte County residents, and $250 for out-of-county residents. The reason for the fee difference is that Butte County requires a mandatory background check for all students. That fee is $150. We have contracted Animal Control to partially pay for Butte County residents who enroll in the class, but outside personnel are not covered, hence the fee difference. Training fee gives volunteers free training for all usual NVADG Animal Emergency Shelter & Evacuation trainings in 2019. Payment is due at registration. ALL ATTENDEES MUST REGISTER AND PAY IN ADVANCE. This training will be sold-out. If you are unable to attend after registration and payment, please consider it a donation as there are no refunds. Skills will include all basic drags, assists, rolls and lifts. Scenarios with more complex extrications. LAL & LARRCO Slings will also be available. Other techniques, if time permits. LEAP, (Lake Evacuation & Animal Protection - Lake County), is hosting a training session on how to set up an emergency small animal shelter on Dec. 1, 2018 from 9am to 4pm at the Lake County Fairgrounds in Lakeport. It is being put on by Sacramento Fire CERT. Lunch will be provided. Need to RSVP as soon as possible. RSVP to leapvolunteergroup@gmail.com. It is not restricted to LEAP or Napa CART members. Anybody with an interest is welcome to attend. infrastructure and recognizing emergency conditions. migrating natural gas and secondary ignition sources. ● Community Wildfire Safety Program. ● Public safety power shut off in extreme weather conditions. The San Francisco Bay Regional Water Quality Control Board implemented new regulations that require commercial horse facilities located in a watershed that flows to a designated "impaired water body" to obtain coverage under a confined animal facility permit program. This includes the Tomales Bay watershed and several others in the North and South Bay. Designed for horse facility owners and managers, this workshop will include information from state regulators, local agency staff, equestrian facility experts, NRCS staff and your fellow facility owners and managers. The workshop will include examples and a template for your horse facility ranch plan, as well as hands-on facility assessment and water quality monitoring demonstrations. Join us at Halleck Creek Ranch in Nicasio on Friday, October 26th at 9am for a workshop covering how to develop a horse facility ranch plan to protect water quality and comply with the State's permit requirements. Join us for COFFEE with an ANIMAL CONTROL OFFICER! The course will train participants in the following areas: importance, roles & responsibilities and essential components of Emergency Animal Sheltering, familiarization with the principles of ICS, how to set up a shelter/layout various locations/facilities, record keeping, roles & responsibilities of Animal Control, mock set up of a shelter, etc. Join UCCE Sonoma & UC Davis School of Veterinary Medicine for a workshop on animal health and husbandry, antibiotic resistance, and use in small-scale livestock farms. This is 7-hour class, (with optional additional hour course), provides the knowledge and understanding of skills and resources necessary to respond to a ATR incident as a single incident, or as a component of large scale disaster involving large and small animal and human elements, and to do so in a safe and effective manner, with low impact on on-going emergency services operations. This course meets and exceeds NFPA 1670 Chapter 17.1 - 17.2 guidelines and covers the most likely animal species that first responders are called to rescue and manage: cattle (beef and dairy), horses, including working horses (police mounts, SAR), companion animals and working dogs (SAR, K-9). Home and Ranch Readiness Summit offers TWO opportunities to learn, train, and meet with internationally renowned veterinarian and K-9 advocate, Guillaume Hoareau, whose passion for working canines has inspired innovation in best practices for trauma care of K-9 partners in every discipline. If you're a canine handler, these are opportunities you won't want to miss! Dr. Hoareau is a Diplomate of both the American and European Colleges of Veterinary Emergency and Critical Care. He graduated from the Toulouse National School of Veterinary Medicine (France). He completed a residency in emergency and critical care at the University of California-Davis and obtained a PhD in Translational Trauma Research from the same institution. He’s currently involved in trauma and critical care research with the US military and balances his time between research and clinical work. This could be the most useful, productive, and possibly life-saving 2 hours you’ll spend this year! A casual “round-table” discussion & workshop focusing on Social Media Best Practices in Disaster Communications and Helping Emergency Managers stay ahead of the community. Interaction encouraged! Please come prepared with questions, and to share your “lessons learned” from recent events. The course is geared to all levels of trailering ability. It will provide the attendee with important information to be a safer, more conscientious, and confident driver. Driver assistants will learn how to direct the driver to maneuver their trailer in and around obstacles. Driver and assistant have the option of switching roles. Leonard Iniquez, Instructor. Hosted by Sonoma County Horse Council. This 2-day Awareness level course is designed for groups or individuals either starting a CART, or interested in becoming a registered Animal Disaster Service Worker, (ADSW), in the jurisdiction in which they reside. Students will receive a certificate from Animal Rescue Training. However, this certificate alone does not qualify students as Animal Disaster Service Worker. Course covers basic fundamentals of the emergency management and Incident Command systems, and provides groundwork for further training as a CART or DART member. Modules with * meet NVADG and/or N-CART training requirements. This training is FREE, and open to Sonoma, Marin, UCDFD* and Napa FIREFIGHTERS, SAR, ACOs, and Volunteers who have certified in FSTEP ATR-Awareness, operational &/or technician from 2015-present. (*BARTA Training also qualifies). VETERINARIANS are welcome to drop in at any time to meet the first responders who are stepping up to support animals, owners, and YOU, to achieve safer response and best outcomes! This course will provide the background information needed to lead a multi-agency team of emergency planners in the development of an ESF annex for food and/or animal related disasters to supplement their community’s existing EOP. The course will address topics such as agroterrorism; detection and diagnosis; the unique challenges that rural communities face in planning for and responding to food and/or animal related disasters; utilization of Emergency Support Functions (ESF); recovery and the importance of sustainable operations during a disaster event; and mapping a community to identify areas of vulnerability and resources. All content will be presented at an all-day instructor led training that will include presentations and problem-solving activities that will be worked on in small groups. Returning volunteers are invited to register for the 1-day, 8-hour Annual Refresher Training. NEW DATE! Saturday, January 27, 2018. This unique class has never been offered before in California. IFAW is sending an expert from Canada to lead the group through instruction and practice. Anybody willing to help deal with the in-person conversations with media, or who would be willing to work behind the scenes with social media such as Twitter, Facebook or Instagram is encourage to attend. There will also be experts in Fundraising who will guide us through this fascinating and exciting subject. If you have any interest in either of these subjects, please join us! October 15, 2017 The course is geared to all levels of trailering ability. It will provide the attendee with important information to be a safer, more conscientious and confident driver. Driver assistants will learn how to direct the driver to safely maneuver their trailer in and around obstacles.Leonard Iniquez, Instructor. Hosted by Sonoma County Horse Council. See flyer for complete schedule and registration. PREREQUISITE: ATR-Awareness is mandatory for ATR Tech participation.